Another week has come and gone, and with it, it is time for me to get on the scales. This week there’s been a small setback as the scales reported 321.4, which is a 1.8 pound increase from last week’s 319.6, and 0.2 pounds above two weeks ago. Not good, but considering how the week went, it could have been worse. The week started off with a bad day as I decided to head down to a Dunkin’ Donuts to pick up some Chocolate Kreme Filled donuts. Sadly, they were out of them, but then the manager had two special made while I waited in the drive-thru, which she gave me for free as well as a dozen, fresh made glazed donuts (first time I’ve had these from Dunkin’ Donuts, and it will be the last time as they don’t do glazed donuts right, unlike Krispy Kreme, who does). The Chocolate Kreme Filled donuts were outstanding, and though I shouldn’t have, I went ahead and ate both, plus a glazed (the rest of the glazed are still sitting in my freezer). Some family members expressed concern over this, but I said that as long as the rest of the week was good, I’d be OK. Famous last words. Sadly, there were a number of events at work so that I was provided with free pizza, free cookies, free sandwiches, and free cheesecakes. Being that this stuff was free, naturally, I had to partake, and that was what killed me for the most part. I probably could have recovered on Friday, which was my scheduled 5:2 Diet fast day. Since the snow storm that came through had me working from home that day, combined with it being a very busy work day, I ended up deciding to just go with a normal Carb Addicts Diet eating day in order to better get me through the day. Had I done the 5:2 Diet day, I no doubt would have dropped back below 320 pounds this morning. Still, this small setback actually gives me a good excuse to do something I’d been pondering for a while. The 5:2 Diet has been great for getting me on the path, but it isn’t something I could do for life, whereas the Carb Addicts Diet is something I could do for the rest of my life, if needed. Before I added the Carb Addicts Diet portion to the 5:2 Diet weight scheme, I noticed that on the days after a 5:2 Diet fast, I would overcompensate by having a mega feast the next day. 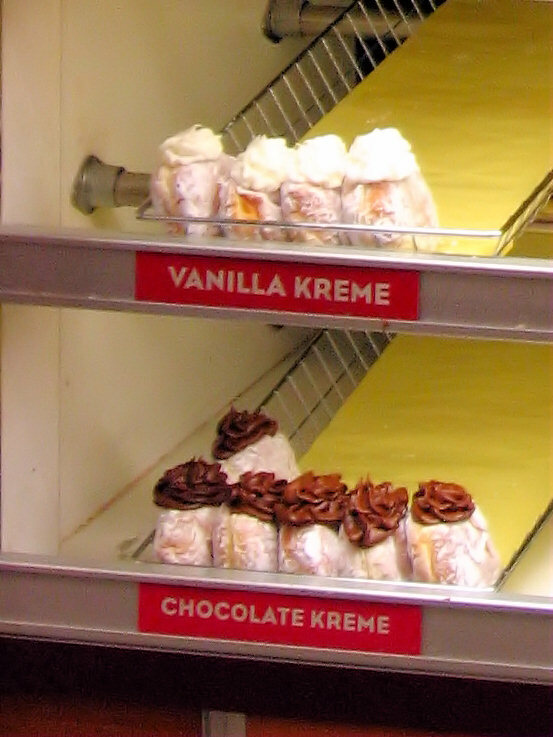 After adding the Carb Addicts Diet to the overall weight loss scheme, I stopped mega feasting the day after, but at times, I still had a tendency to still eat too much, as evidenced when I went ahead and had both Chocolate Kreme Filled donuts (as mentioned above). I was satisfied after the first donut was consumed, but I said, “who cares” and ate the others. Further, I have noted to myself that on days prior to a 5:2 Diet fast day, I have been eating more heartily that evening with the excuse, “Well, I need to fortify for a tough day of eating very little tomorrow!” That’s not a good thing. As such, I’m going to drop the 5:2 Diet portion of my weight loss scheme and just continue with the Carb Addicts Diet portion. Back in 2007, I dropped from ~330+ pounds to 285 pounds in 2008 just on the Carb Addicts Diet, so weight loss can easily be done on this diet plan alone. The 5:2 Diet did what it was intended, but I feel now that in order to better proceed in my long term weight loss goals, I need to move on from it. We’ll see how things go for the next four weeks and revisit the 5:2 Diet if needed. For now, it is a solo Carb Addicts Diet. This entry was posted in Weight Loss and tagged 5:2 Diet, Carb Addicts Diet on February 1, 2014 by AstroNerdBoy.